A couple weeks ago, I mentioned that Embroidered Flowers for Elizabeth by Susan O’Connor, published by Country Bumpkin, was released, and today, I want to show you the book up close. It’s a beautiful book featuring a beautiful project – but it’s more than that! 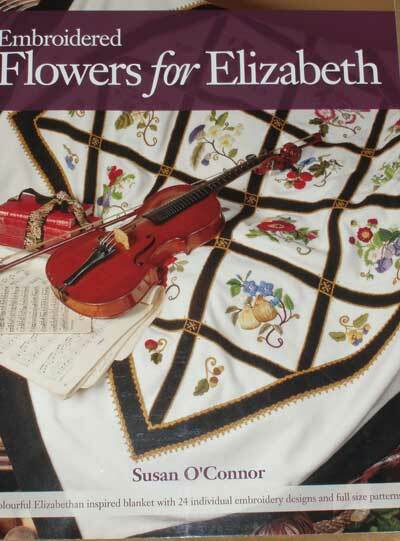 The main project featured in the book Embroidered Flowers for Elizabeth is a gorgeous wool blanket divided in diamond-shaped panes, and displaying a selection of hand embroidered flowers that reflect the style of the Elizabethan era (the Renaissance in England). Susan O’Connor, whose embroidery designs always capture my eye, has really written a winner of a needlework book with this one! 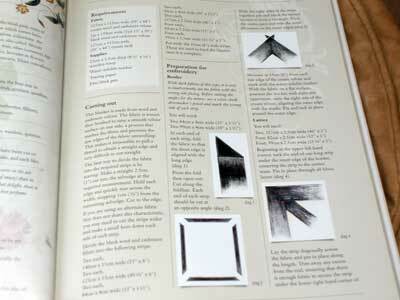 It is fantastic – the book is beautiful in every sense of the word, and the designs within are versatile. While it is certainly a project book – a how-to book – it is so pretty that it deserves a nice spot in your home for display. It would look great on the coffee table! 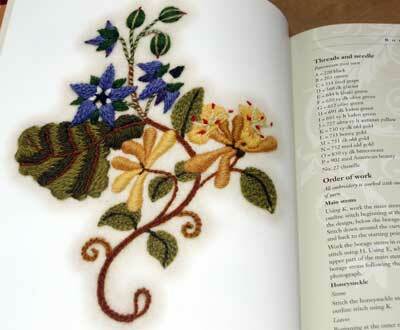 The quality of the book is Country Bumpkin quality – they do produce the most gorgeous needlework books! The blanket itself is striking: diamond shaped panes reminiscent of Tudor windows, the black panes outlined with gold stitching on a cream ground speckled with the colorful flowers. It’s a very sophisticated design. The book begins with a short history of the Elizabethan era. There’s not a whole lot “new” in this section – it’s your typical text-book history that doesn’t delve into primary sources. The section following the “history” moves into the textiles of the era, and this much more interesting. Here, you’ll discover the significance of the flowers featured in the book. After this brief introduction, instructions are given on setting up the blanket project, placing and embroidering the panes on the blanket. But what if you’re not really into making and embroidering blankets? Oh! Never fear! 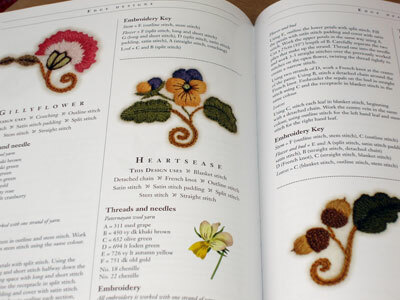 This book is a perfect multi-project book for anyone who loves embroidered floral designs, all of which are suitable for a variety of needlework techniques. The book is broken down by floral motif. Each section on each floral arrangement begins with a clear color photo of the finished floral design. 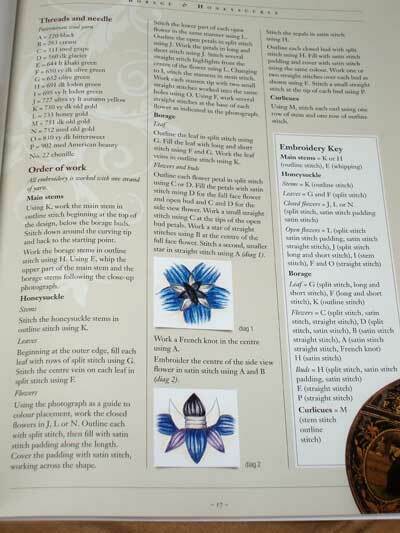 The floral design is followed by a materials list and stitching instructions. Paternayan wool is used for the embroidery on the blanketl. 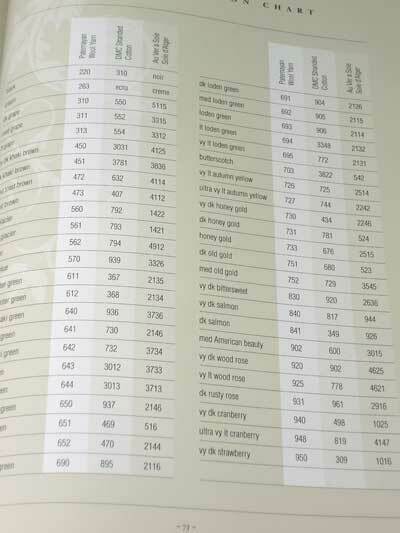 But for those not interested so much in wool embroidery, never fear – there’s a handy thread conversion chart in the back of the book. Besides the general stitching instructions for the whole motif, there are step-by-step photos for the different stitches used in each motif. 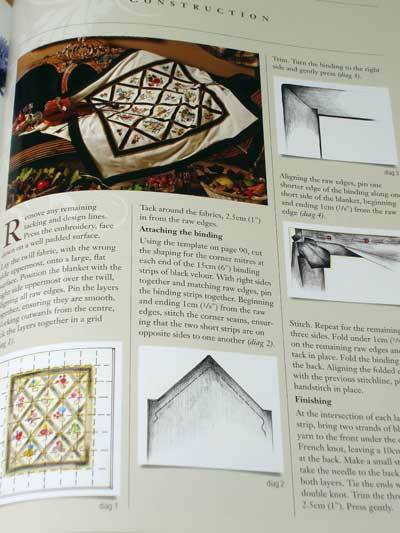 If you appreciate other Country Bumpkin publications (for example, the A-Z Series of Needlework books), you will certainly like these step-by-step photos. Oooooooh. 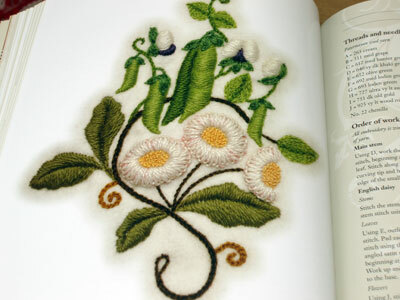 My Absolute Favorite in the Whole Book is this Pea & English Daisy design. I just love it! I love the greens, I love the peas, I love the daisies, I just love this motif! It’s beautiful, isn’t it? After the larger floral motifs comes a section on smaller designs. These are like a little sampling taken from the larger floral designs – they’re little, sweet, perfect designs that could be stitched individually (relatively quickly) for a variety of applications, such as needlebook covers, pin keeps (as shown in the book), or whatever your imagination can devise! Following the embroidery instructions are the instructions for constructing the blanket. One reader mentioned that these instructions are a bit confusing. After reading through them, I think that someone who has constructed blankets or quilts before would find the assembly instructions clear enough. They aren’t necessarily written for an absolute beginner, but I do think they are manageable. The thread conversion chart towards the end of the book gives color numbers for DMC stranded cotton and Au Ver a Soie silk (Soie d’Alger). 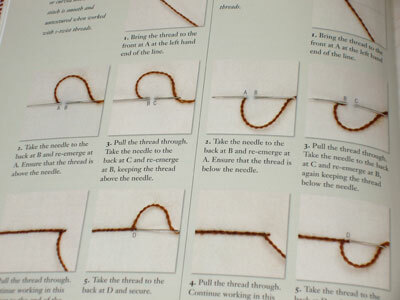 The author specifies the difference in stitching, should you choose a different thread to work with. Some suggestions are given for individual projects with the small motifs. Very pretty! I love the addition of the gold spangles around the flowers. 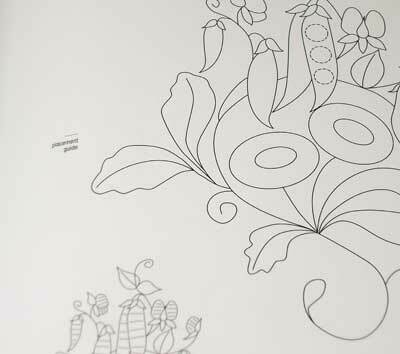 And finally, the last section of the book is filled with all the line drawings, as well as drawings that indicate stitch direction. All in all, the book is everything I was hoping it would be! The designs are so pretty, and oh, the possibilities! Silk shading, stumpwork, goldwork, whitework – the designs are versatile and easily adaptable to other techniques. Country Bumpkin Publications – located in Australia; the book costs AU$34.95. For those ordering outside Australia, be prepared to pay shipping costs and, where applicable, customs duty. The Book Depository (Thanks, Irene!) – this is located in the UK, but shipping worldwide is free. I ordered a copy from here ($21.81) and had it within a week. Amazon UK – Though not available on Amazon in the States yet, the book can be found on Amazon UK for £13.27 (US$20.22 right now). And, finally, this weekend, I’ll be giving away a free copy of Embroidered Flowers for Elizabeth, so keep an eye out for the give-away! your review only makes me want this book even more… I never win anything but I hope I will win your give-away… I would *KILL* for a copy of this book… I am fastly becoming addicted to your blog! I also would like to win this book. I think the pictures are wonderful and it would be an awesome resource to have and to explore new designs. Keep up the good work of keeping us informed on the resources becoming available. Susan O'Connor is a treasure and this book is one of her gems. It definitely deserves the Coffee Table label. Oh darn. I was SO hoping this book wouldn't be spectacular because I really don't need to add any more to my wish list! It appears you have dashed my hopes and this will have to go on my list straightaway. I think it will have to be in top place too!! Hope you don't mind- I'm posting a link to this review on Twitter. Ohhh! I do love Susan's elizabethan designs. I put my name on the Amazon list a few weeks ago. Hoping they get it in SOON. I bought this book from Book Depository (thanks Irene from me, too) and also had it in a week. I've been examining it minutely with great pleasure ever since. Country Bumpkin publications are absolutely the best, with clear instructions and beautiful photography. I've bought this book from Amazon UK, having had it on order since Christmas and I haven't looked at it yet. I've been saving it for a day like today when my husband has gone to a football match and I have some time to browse. I just know that it will be gorgeous. Dear Mary, your web site has been incredibly useful for me in every topic you bring up. But I enjoy your book reviews at most. I have not been disappointed in any of the books you recommended. I am positive that this book is everything you say it is as well. I cannot wait to have it. I probably will attempt to embroider the flowers for small separate projects rather than the blanket. 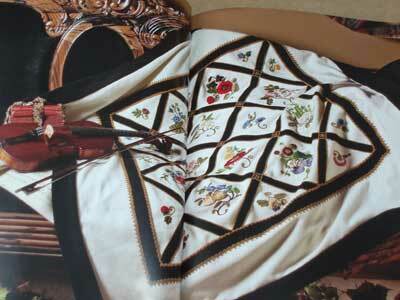 I love to study the history of textiles and embroidery from the Elizabethan through the Edwardian periods. I have a beautiful book entitled: The Needlework of Mary, Queen of Scots. In this book, historical and personal by-lines tell us that Mary sat in prison and did her needlework along with her jailer's wife. Mary tried unsuccessfully to win her "sister" Elizabeth's sympathy by making her beautiful gowns, etc. Elizabeth accepted these gifts, but sadly, although she suffered over the decision, she finally allowed the other queen to be put to death. It is fascinating in the context of the womens' roles and their shared interests. I would use individual designs as I can then use them on a variety of materials even clothing. I haven't entered a drawing in a while because I only enter when it's something I am truely interested in doing soon. I adore this book. I put it on my gift list as soon as I saw it. I haven't done much embroidery except cross stitch and hardanger. I am itching to make this blanket! Thank you for your very generous giveaway…great book, and other gifts too. I would like to make the blanket. I am still learning, and this looks like the perfect book to learn by and have a work of art when finished! You have done a lovely job reviewing this book, I can see why you like the daisies and pea pods! I love the pea pod needle cases they used to have in olden times. Your review of the book made it blossom before my eyes! The embroidery looks so lifelike you could almost smell the flowers' fragrance. I am new to embroidery and am working on embellishing a crazy quilt block for a fundraiser (The Palmettos Tatting Guild Scholarship fund.) I know I would find much inspiration in this new book. Thank you for your overall generosity and the wonderful information you have posted on the website. It has been a help to me. What a gorgeous book! I love the embroidered flowers and would love even more a chance to try my hand at them!! What a wonderful book. I think I would like to make the individual designs. I can think of many different projects that these could be used on. 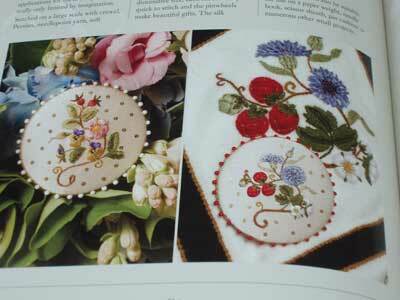 Thanks for sharing the review of Embroidered Flowers for Elizabeth, I found it interesting. Will order my copy today. This is a beautiful book. I would love to have it. would love to win this book …..if not will definitely get it from amazon . thank you for sharing. i would like your interesting about book for using stiching. pls send me free book project .thank you for sharing. Hi-Mary, Don't include me in the giveaway but I did want to say that the flowers are very pretty. I'd make them in silk ribbon embroidery since I am not a thread painter. Lovely book, pretty designs. Your review on the book makes this book even more desirable. How much I wish I can get hold of one copy :). Hoping I might win ;). i would use the thread i have on hand. I bought wool thread thru estate sales and most is not marked. I would match best I can to the colors in the pattern that choose from book. Thank you for giving this chance to us. This book is really a fortune to have it. Using which tread it depends on the project and the material I am using. I would use the conversion chart and do them with different threads. I would first do the ones with that I wanted to do with the suggested threads since I am new. Then I would use different threads to experiment with them. look so beautiful and delicate. Oh no! I just discovered this site and it’s too late to enter the draw. I’ll just have to put this site on my favourites list. I am looking for a free hand embroidered flower arrangement using a lot of white daisy’s. I need it to be already to embroidery. I am no good at piecing things together so thought you might help me or tell me where I can find can go to get it. Next Next post: Embroidered Flowers for Elizabeth – GIVE AWAY!